Flawless in concept, design & finish. Lid Snaps fit on the body. Belt fits snugly and uniformly on the body thanks to precision clip which keep the belt in fair tension. Belt slots and perforations of the body correspond accurately. Custom designed chain for comfortable latching. Configuration, design & Material confirms IS 3831 in all sizes. Crown S.S. 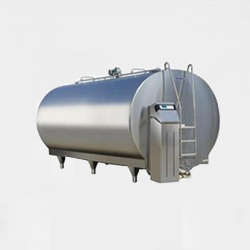 Milk Cans available in 5, 10, 20, 40L Capacity. Every Milk Can passes through stringent quality control tests at various stages of manufacturing before it reaches you. Tig welding process is used with purging to give fine welding quality. 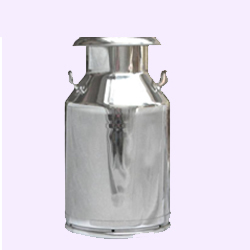 All the Milk Cans are made caring hygienic point of view giving mirror polish. S.S. 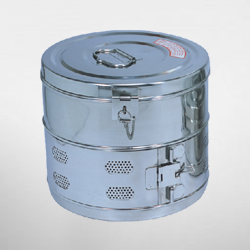 Milk Can is made from AISI 304 (S30400)grade 8/18 AISI Stainless Steel material Only. S.S. 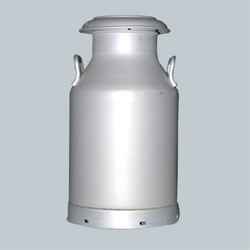 Milk Can dimensions are close to the aluminum alloy Milk Can (IS : 1825-1983).